As part of its efforts to reduce the stress state on North American railroads, the Association of American Railroads (AAR) mandated that all new cars ordered after January 1, 2002, must be equipped with constant contact side bearings. Constant contact side bearings (CCSBs) raise the threshold speed at which lateral instability, or hunting, takes place. As seen in Figure 1, CCSBs can raise this threshold from 40 mph, on cars equipped with conventional gap style side bearings, to more than 70 mph. Lateral acceleration, which is a measure of hunting severity, increases rapidly once hunting starts and speed increases. In any mechanical system there typically are trade offs in different areas of performance. Three-piece trucks are no different in that an improvement in hunting usually comes at the expense of curving performance. The dramatic improvement in hunting control also has the negative effect of increasing turning resistance in curves. 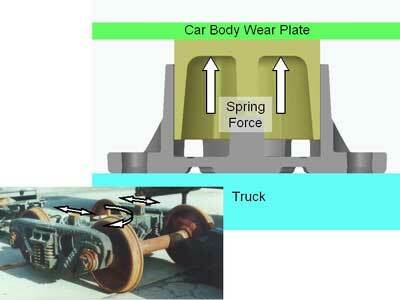 As seen in Figure 2, the CCSB pushes against the underside of the car body with a given force. If the truck begins to rotate, the frictional force at the CCSB/car body wear plate interface will begin to resist this movement. If truck rotation continues, the CCSB will continue to resist rotation and dissipate energy in the form of heat generated by the friction. 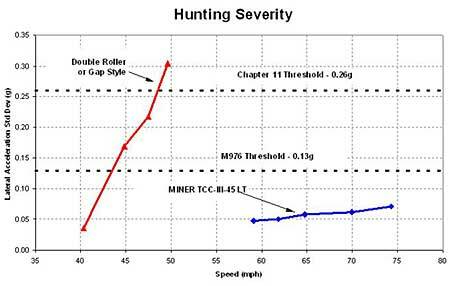 While this is beneficial from a hunting standpoint, truck turning resistance has a negative effect on negotiating curves. In an effort to understand the effect of the CCSB mandate and the effect of side bearing design on railcar performance, the AAR conducted a series of tests at Transportation Technology Center, Inc., (TTCI) involving different car types and side bearing designs. Side bearing manufacturers were asked for side bearing design recommendations for different car types. The cars chosen were intended to represent the fleet from the standpoint of truck centers, stiffness, center of gravity and propensity to hunt. 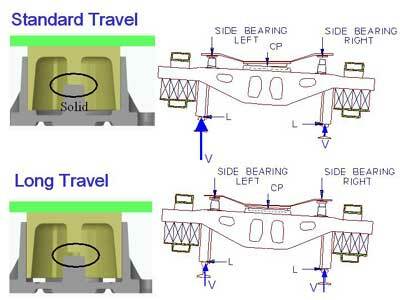 The performance of metal and non-metal capped, long and standard travel CCSBs was compared to the performance of gap style roller side bearings (see Figure 3). One conclusion of this testing was that metal capped side bearings provided superior performance by increasing operating speeds with a higher and more consistent level of friction at the CCSB/car body interface. More importantly, the AAR concluded that in many cases the long travel CCSBs actually improved curve negotiation, from a wheel load equalization and L/V standpoint, despite the modest increase in truck turning resistance. In addition, long travel side bearings improved car negotiation of track irregularities such as those found in the dynamic curving requirement of Chapter XI. As a result of this testing, the AAR modified the CCSB mandate to require long travel metal capped CCSBs, effective January 1, 2003. The AAR also expanded the mandate to include certain classes of rebuilt and reclassified cars. What are long travel side bearings? Normal gap style side bearings allow approximately 1/4 inch of travel at the side bearing when the car body rolls and the side bearing is at its nominal set-up height. 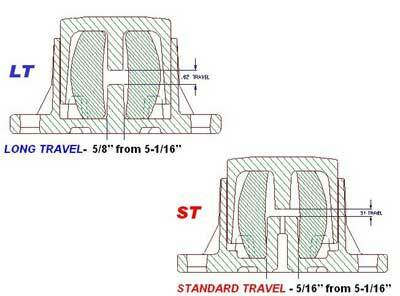 As seen in Figure 4, standard travel CCSBs allow 1/4 – 5/16 inches of travel at the side bearing before the car body roll is limited by solid stops. Very simply, long travel CCSBs allow 5/8 inches, or twice as much travel. Miner Enterprises, Inc., developed the first long travel side bearing, the TCC-II series, in 1991, in response to an industry need for a CCSB that was more forgiving, from set-up standpoint, on articulated intermodal cars. Articulated connectors have multiple surfaces that wear and can cause the male side of the connector to drop in relationship to the female side. This reduction in height is transferred to the side bearings on the male side of the connector, as seen figure 5. Through testing at TTCI, TTX concluded that this extra travel not only provided more flexibility with set-up height, it also improved negotiation of entry and exit spirals. Subsequently, TTX experimented with the long travel at other locations on articulated cars and found improvements there as well. 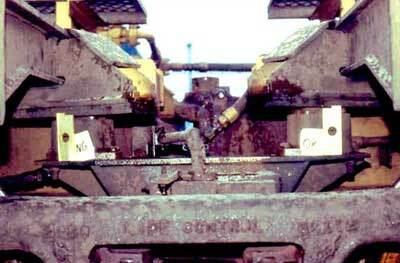 TTX then incorporated long travel in stand-alone intermodal and autorack cars. Since that point, long travel benefits have been realized in almost every car type. An extra 5/16 inches of travel may not seem like much, but the added travel is significant when decoupling the car from track crosslevel differences. As shown in Figure 6, a standard travel CCSB can “go solid” entering and exiting a curve. This causes the car body weight to be transferred to the high side of the rail, resulting in wheel unloading and high lateral over vertical (L/V) loads. Gap style side bearings would produce the same type of wheel unloading and L/Vs, because the travel is essentially the same. In contrast, long travel side bearings provide enough flexibility to not “go solid,” resulting in better wheel load equalization and modest L/Vs. Over the years, the rail industry has experienced a number of costly derailments due to high-speed stability and car body roll. In 2004, TTCI and a consortium of tank car owners and side bearing manufacturers conducted tests to evaluate the effects of CCSBs on tank car roll. Five side bearings were tested, including the original gap style block design. Vertical wheel loading was significantly improved in the twist and roll section of track at TTCI by using elastomeric long travel CCSBs. This improvement was enough to pass the minimum wheel unloading levels required by Chapter XI because of the long travel and the CCSB vertical damping, which was achieved using designs with elastomeric springs. High-speed stability was confirmed at speeds up to 70 mph. As a result of this testing, the AAR mandated long travel CCSBs on all existing tank cars as of April 2005. Bill O’Donnell is Manager of Product Engineering for Miner Enterprises, Inc.